Delta Air Lines on Thursday unveiled a new premium economy class seat for its airliners, seeking to tap into the fast-growing market for frugal business travelers and economy fliers who value comfort over price. The new premium economy class, dubbed 'Delta Premium' will add a new class of seating onto its upcoming Airbus A350s, which begin international service in late 2017. The new section will be arranged at eight seats across each row, with two outermost seats separated by the aisles. Each 19-inch wide seat will feature a 13.3-inch in-flight entertainment screen, in-seat power ports and 38 inches of pitch, a measurement of the distance between the same point on two seats. That's about six to seven inches of additional legroom and an inch wider than standard economy seating. In addition to the larger seat, passengers on-board will receive a beverage before departure, an amenity kit, premium blanket and noise canceling headphones. At the airport a Delta Premium ticket will get you faster check-in and security lines, as well as earlier boarding and expedited baggage return. Delta's move follows American Airlines introduction of a premium economy class for its long-haul jetliners as well. Airlines around the world such as Lufthansa, Singapore Airlines, Cathay Pacific, Air New Zealand, Air France and Iberia have all added new premium economy sections to their planes. As opulent first class seats have faded from use, airlines have focused on courting high-value business travelers with fully lie-flat seat beds and other hotel-like amenities. Such tickets can run as much as a compact car, while an economy class seat has remained largely the same through the history of jet flying, wildly separating a passenger's experience. Airlines are seeking to tap into a quickly growing market for more-frugal business travelers and economy fliers who are willing to value comfort and space over the price of a seat, said Henry Harteveldt, founder of the Atmosphere Research Group. "As they develop these [premium economy] products there's a balance between the premium side and the economy side," said Harteveldt. "You want it attractive enough to attract someone from a standard economy fare...but you don't want it to be so good that someone who usually flies business class will trade down to premium economy." The Atlanta-based airline will first fit its new long-range A350s with 48 Delta Premium seats, and plans to deploy the new class on its Boeing 777s starting in 2018. Delta said its other jets may be added over time. Delta also plans to introduce an all-new business class seat with fully-closing door on its A350s. American's own competing premium economy seating debuts on international flights starting with its new Boeing 787-9 Dreamliner on Thursday night, connecting Dallas-Fort Worth to Sao Paulo and Dallas-Fort Worth to Madrid Friday evening. 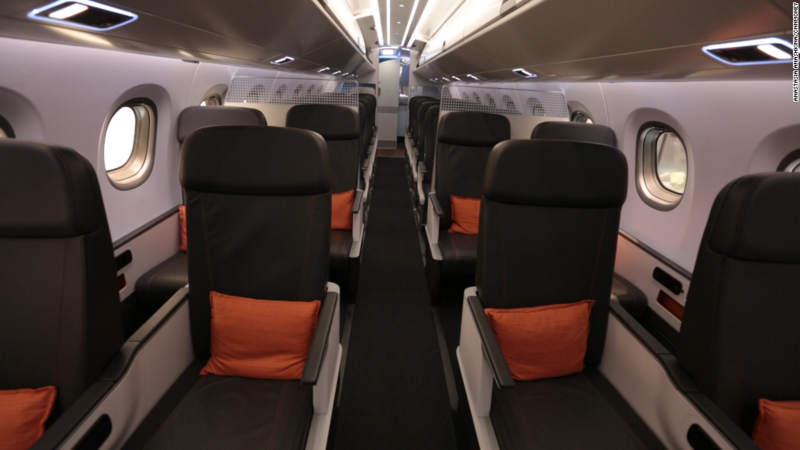 The airline currently sells those seats under its Main Cabin Extra economy product rather than a distinct class, that begins next year.